TV historian Tristram Hunt, known for his series on the English Civil War and his national newspaper columns, was one of the most high-profile of the new MPs elected in 2010. Nine months later how is he finding the job? 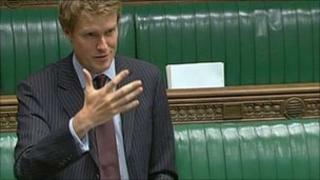 Tristram Hunt is inordinately proud of his cup and saucer. The Labour MP displays the delicate china pieces in the corner of his Westminster office - behaviour more reminiscent of a maiden aunt or a local museum curator than a hardened politician. He explains that the blue-and-white patterned crockery comes from "his" city - Stoke-on-Trent. Part of England's historic potteries, the area has been hit hard by the decline of the UK ceramics industry. Once it employed 50,000 people in the area - now the figure is nearer 6,000. With the air of a Cambridge-educated TV historian - which he is - Mr Hunt discusses the mindset he has found since being elected to represent Stoke-on-Trent Central in Parliament last May. "There's a sort of collective trauma," he said. "The mines and steel industry went along with the ceramics. "The response about a decade ago was to try to obliterate the past out and sort of 'cleanse', removing the old bottle ovens and other relics. Now there's a realisation that there is actually a brand to this city and it's not being used. The question is how to exploit it, how to use the brand advantage." The crockery in Mr Hunt's office is made by Spode, a firm which had outsourced its manufacture to the far east but, unhappy with the result, brought it back to north Staffordshire. Holding the teacup, Mr Hunt said: "We can't compete with Vietnam on price but we can compete on quality." The privately educated son of a peer is trying hard to become part of the community. In some ways the 36-year-old father-of-two had a gilded journey to Westminster. He is a friend of Lord Mandelson and worked as a volunteer on Labour's 1997 and 2001 victories. Mr Hunt was chosen as Labour candidate for Stoke-on-Trent Central - one of the party's safest seats - at almost the last possible moment before last year's general election. Sitting MP Mark Fisher withdrew because of ill-health and, after Labour's central office drew up a shortlist of candidates - none of them local - Mr Hunt won easily. Gary Elsby, Stoke-on-Trent Central's Labour Party secretary, was so angry about an outsider being "imposed" that he resigned his post and ran as an independent. Mr Elsby got just 399 votes and Mr Hunt won comfortably, albeit with an almost halved majority of 5,566, as his party recorded its lowest rating nationwide since 1983. Mr Hunt said: "There's no doubt that the selection process and the result frustrated and upset some people. But one has to remember that Mark Fisher resigned three-and-a-half weeks before the general election was called, so we needed a quick selection procedure. It was down to the shortlist that [Labour's] NEC [National Executive Committee] drew up. "Some people left, and that's unfortunate. But since then we have added about 40 new members to the local party." Mr Hunt, known nationally for his TV series on the English Civil War and his biography of Communist Manifesto co-author Friedrich Engels, wants to build his profile in Stoke. "It's a learning curve. Part of that is being active. I've been to every secondary school in the constituency and I'm going to primary schools. "I've also been helping out with the teaching on Fridays in local sixth forms. It's enjoyable to keep doing history, although every time you go in a classroom on a Friday afternoon, people are looking forward to other things and it's harder to hold their attention. "You just have to be genuine in what you do. If my local party are unhappy with me they will tell me. I'm holding regular surgeries and a lot of meetings to ensure I'm accountable for my actions." The MP is keen to say he is fast becoming a fan of Stoke City FC, and that it is "great for the city to have a Premiership football team" as well as Port Vale, a League Two club. But the whiff of being a "carpetbagger" - an insulting term for candidates with no local connections who are parachuted into winnable seats - persists. He said: "I'm from a different part of the country and there's no doubt about that, but I love it in Stoke." He professes to enjoy Parliament too. "Being an opposition backbencher teaches you about Parliament and how Parliament works. It's like an old-fashioned apprenticeship in that there's a skill there about parliamentary procedure that you have to learn. "You might know about politics but you don't already know how the chamber operates when you arrive." Mr Hunt, who sits of on the constitutional reform committee, has been vehement in his opposition to replacing Westminster's first-past-the-post elections with the alternative vote (AV) system, allowing the electorate to rank candidates in order of choice. He said: "I have a view that there's nothing better than being able to throw the buggers out. "The AV proposal is like chips with everything: whatever the result of the election, the Lib Dems will be part of the government. "It's not good for politics. It loses the essence of real democracy. The AV referendum would also cost £100m, which is ridiculous in a time of austerity. "It was painful, but I like the fact that we were gotten rid of in a clear vote. One coalition doesn't make a summer." Perhaps this is a legacy of the heady excitement of 1997 and 2001, when his party won decisively? Mr Hunt insists his position is "more reasoned" than that. But like any MP, however cerebral, he has had to get down and dirty. In fact, he seems to enjoy baiting Conservatives in the chamber and the press. In one Daily Mirror column, he likened the coalition's spending cuts to Victorian methods of dealing with the "undeserving" poor. He informed readers that young boys in the poor house were once "sent out to work in the tanneries and were so starved they gnawed on rotten bones and putrid horseflesh to stay alive". It is all very Dickensian - perhaps a bit too cartoonish and unrealistic? "British politics has a certain culture and we are here to oppose for the good of the country," Mr Hunt said. "We are the loyal opposition. I think David Cameron is very good at presenting himself as the modern, pleasant face of the Tories. "You lift the veneer and you see the incredible connection of the modern Conservative Party with the financial services sector." Opposition is tiresome for ambitious politicians and Mr Hunt would like to be a minister. "Part of the problem with opposition is that no-one is that interested in you, meaning you have to say something that's both newsworthy and of the biggest interest. "We would like to be in government. Obviously it would be good to be a part of that, especially if it involves urban planning, urban regeneration or education policy. Those are strong areas of interest. "Stoke-on-Trent has not had the number of ministers it needs in order to give the city the help it needs." Mr Hunt admits being fatigued by his new workload. He said: "I'm not a sort of ingénue. I've worked for the party. But it's very different from being an MP. The biggest challenge since last May is how I manage my time between working in Parliament, the constituency and home life. It's difficult. "It's gone incredibly quickly. It's a privilege and it's very enjoyable, having been a historian who has looked at this from afar, to be in the thick of it. "I think it's the chance actually to do something. You can write and commentate and critique from the sides but that won't do anything to change anything. You've got to try and do something." He added: "I don't thing you should be here too long. People should not continue in the House of Commons for too long. It's a tiring job and you don't want to feel too tired and start to treat the place like a club. It's not a club."